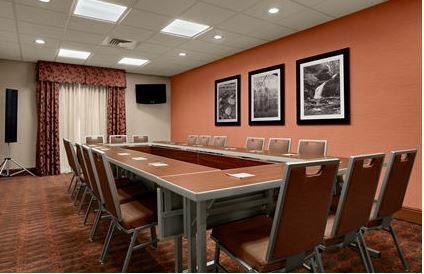 For small meetings or events, our meeting rooms in Magnolia, AR provides meeting room, and reception and banquet space with all of the important features. Expect free hot breakfast, and free high-speed internet access in every guest room. at Hampton Inn Magnolia. This Magnolia hotel meeting space accommodates up to 50 people. Ask about our options, including business center. Use the 'Check Availability' link on the right side of the page and find more information on group room blocks. Plus, we'll help you create a complimentary personalized, online page to help make the reservation process easier. Our friendly hotel staff Magnolia, AR will be happy to help you get started. At Hampton by Hilton™, we offer the facilities you need and the amenities your attendees want. And now, with our Meetings Simplified by Hampton package, you also get simple, bundled pricing to make planning your meeting a breeze. The only thing you need to worry about is the agenda. Our Meetings Simplified Package* Includes: Meeting room Basic meeting Wi-Fi Flip chart and markers All-day non-alcoholic beverage service *Minimum of 10 attendees required. Taxes and gratuities not included. To begin planning your next meeting, click the Request Pricing button above or call the hotel and ask to speak with the Sales department. We will be happy to customize a bundled per-person quote for your meeting.